Last week was tough. Speaking about my own experiences and the impact on my family, while highlighting my own “difference”, is probably one of the hardest things I’ve done politically. I should stress I am proud of every part of my identity. The messages of support have been heartening, and while the countless stories of others’ experiences have been hard to hear, it has only strengthened my resolve. But one phrase has stayed with me: “solidarity is welcome, but it’s action we need”. I have been doing a lot of thinking and here I present some considered reflections and what I believe are reasonable actions that the Scottish Labour Party should take going forward. This would demonstrate that it understands the concerns raised and that it is taking meaningful action. I want to repeat what I have said in every conversation, in every piece of communication, and in every media comment: this isn’t about one individual or one party/organisation. My focus, and I believe the party’s focus, must be on the wider issues of everyday racism and everyday Islamophobia that exists in society. This impacts on workplaces, college and university campuses and playgrounds across the country. As the Labour Party – a political movement born out of the desire to fight for equality, to defeat prejudice, and to end injustice – we must hold ourselves to a higher standard. So, if we accept that there is everyday sexism, homophobia, racism, antisemitism, Islamophobia and more in wider society, then we must also accept, as a party reflective of society, that we too are not immune to this. What I have set out in this document are steps that I believe the party should put into motion immediately. This would demonstrate to the public how seriously we take this issue and also act as an example to other political parties and organisations. Finally, this shouldn’t have to be said, but I don’t want anyone to be in any doubt: the issues I’m raising are not related to the leadership election. I am proud to support my friend Richard Leonard as leader of the Scottish Labour Party. I don’t doubt for a second his unwavering commitment to equality and tackling discrimination in all its forms. I look forward to working with him and the wider movement on this. I hope that the issues raised will be taken in the comradely spirit in which they ate intended. It is in all our interests that we address these issues and move forward with confidence. In the coming days, I will also be setting out what actions I believe the Scottish government can take to address everyday racism and Islamophobia in wider society. I’m confident these will be measures that speak to our principles as a party and will therefore have the support of the movement. It is a matter of deep regret that there is currently no BAME representation on the governing body of our party in Scotland. The SEC is responsible for providing a strategic direction for the Scottish party; for organisation and management of constituency parties, forums, parliamentary groups and council groups; for oversight of candidate selections; personnel recruitment; recruitment and servicing of members and – crucially – equal opportunities, to ensure the correct policies, procedures, training and monitoring are in place. In that context, it is surely regrettable and unacceptable that there is no BAME member of the SEC. A fact I’m sure that would be of great surprise to our membership and the public. Mechanisms exist for the National Executive Committee of the UK party to ensure there is always at least one BAME member. This is in the form of a reserved place. The Scottish party should take immediate steps to resolve this. I have been struck by the number of people who have been in touch with me over the last few days to share their own experiences of everyday racism and Islamophobia. I should stress that these are, in the main, individuals sharing their experiences outside of politics. An overwhelming feeling from them when discussing what actions should or shouldn’t be taken was that the biggest barrier to action was an inability or a fear to speak out – that they wouldn’t be listened to, that they wouldn’t be believed, that they wouldn’t be taken seriously or, worse still, that they may face consequences. That is why I believe the party should be leading by example and setting up a system, where if someone doesn’t wish to make a formal complaint then a process exists to report any incidences anonymously and independently. I understand the need to follow due process and for the accused to be able to make a defence when a formal complaint is made. But the ability to report anonymously and independently creates a safe space for an alleged victim to voice their concerns and to seek support. It also allows the party to identify any patterns of behaviour that may exist with any individuals, which may then lead to subsequent action. The party should immediately embark on a programme of providing equality and diversity training to all its elected members, aspiring candidates, party officers, party staff and constituency parties. This training should include all forms of discrimination and prejudice. We are the Labour Party – we must lead by example. It is also worth noting that there are currently no BAME members among party staff. That is in no way a slight on them, as they are often under-valued individuals who dedicate every waking and breathing moment to our party, but just a statement of fact. It is important that there is BAME representation at every level of decision-making, not just at an elected level. Quite often it is the staff who support politicians and parties who have greater influence than many individual elected members. The party should therefore consider recruiting an equalities and diversity officer who can play a key role in training, representation, engagement, policy making, organising and more. Currently BAME Labour is affiliated to the UK party, but it is not affiliated to the Scottish party. Through its formal relationship with the UK party it has a role in encouraging greater representation for BAME members in elected positions, influences policymaking and community engagement, and works to eliminate racism and discrimination. It also allows for affiliated BAME members to be recognised in local constituency parties. These are aims that we surely share in Scotland, so we should be replicating that positive relationship. We have an active BAME Labour branch in Scotland. The Scottish party should be working with them to give them a level playing field with members living in England. In our entire history in Scotland we have only ever elected two BAME MPs and two BAME MSPs. Two are the same person and two are from the same family. This is a woefully low figure. While some progress has been made at a local government level, this remains a small number. With the selections for winnable general election seats coming up and the Scottish Parliament seats to no doubt follow soon after that, we should be considering how we can encourage more BAME candidates to stand – and then how we can encourage more to be selected. We have previously written into the selection procedures that at least one BAME candidate will be shortlisted in every seat where at least one BAME member puts themselves forward for selection. It is regrettable that this is no longer the case. This change is a backward step; and a backward step wouldn’t have happened if there was BAME representation on the SEC. This measure will not automatically mean that more BAME candidates will be selected, but it will act as an encouragement for more individuals to put themselves forward – and at least increase the likelihood of BAME candidates being selected. The SEC recently agreed to do away with parliamentary panels and instead agreed a process where each constituency party will appoint a selection committee from among its own membership. This committee will oversee the section process and be part of the vetting of candidates. It is right that the rules for the make-up of these committees includes gender balance and also representation for trade union affiliates. This guidance should also include a requirement for BAME representation on the selection committee. In the absence of BAME members, every CLP has a BAME officer whose role is to encourage BAME membership and engagement, and they should sit on the committee. It was clear from the leadership election that the party did not have robust mechanism in place to process and manage applications from BAME individuals. There were clear issues with how the party’s IT system dealt with individual applications. There were also clear gaps in the training of staff on how to deal with BAME names. I know that hundreds of individual concerns were raised with the party, the majority of which were eventually resolved – but not all. No individual should feel that they have been disenfranchised because of their name. To avoid this happening in future, and to ensure that all individuals and communities have confidence in membership handling, the party must be open about the lessons it has learned and what new processes or training have been put in place. The elections for the Scottish Policy Forum will begin soon. The SPF has an important role to play in policy development and in the development of our manifestos for the Westminster elections and the Scottish parliament elections. We must ensure that the voice of Scotland’s BAME community is heard in this process. There will be a BAME interest in the impact of all policies, but there will also be policy ideas that relate to the wider issues of racism and prejudice and the impact that has on life chances and outcomes. The party should outline what steps it is going to take to ensure that there is BAME representation in the membership of the Scottish Policy Forum. 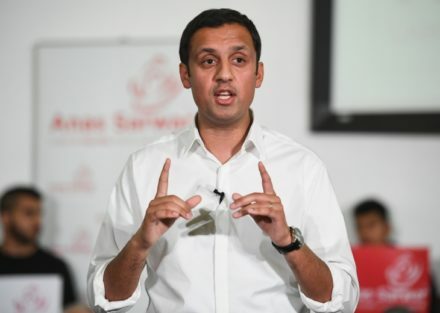 Anas Sarwar is the Scottish Labour health spokesman and Labour MSP for Glasgow.